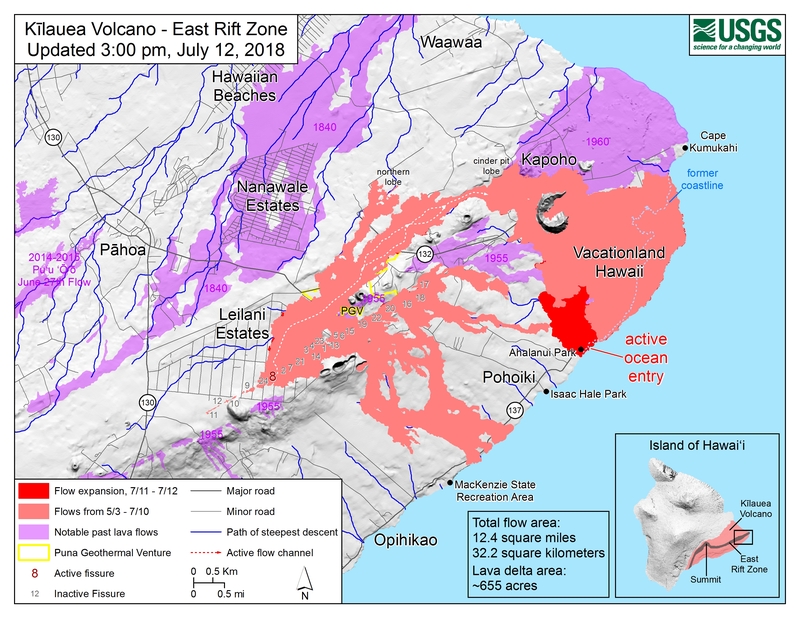 The Lower East Rift Zone eruption has settled back into a routine. Unfortunately, that routine includes the far end of Fissure 8’s lava flow crawling south along the coast, eating landmarks in its path. Isaac Hale Park/Pohoiki boat ramp (see flow map) is next in line. The morning USGS overflight reported that the flow front was about 1km away. That little island is still there this morning. Fissure 8 continues to erupt into its perched channel, with its volume surging after yesterday’s 7:08pm summit collapse (Mag 5.3) and returning to lower levels by morning. That pulse caused a brief overflow on the east/southeast of the channel a short way downstream from the vent, but it stayed on the apron of previous flows. 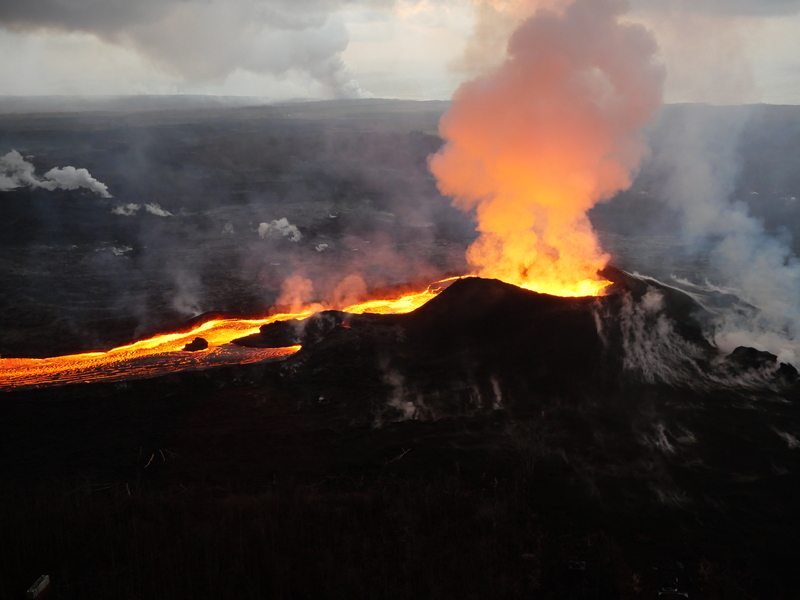 The channelized a’a flow west of Kapoho Crater continues to be the main conduit to the ocean and to the active flow expanding southwards along the shore. 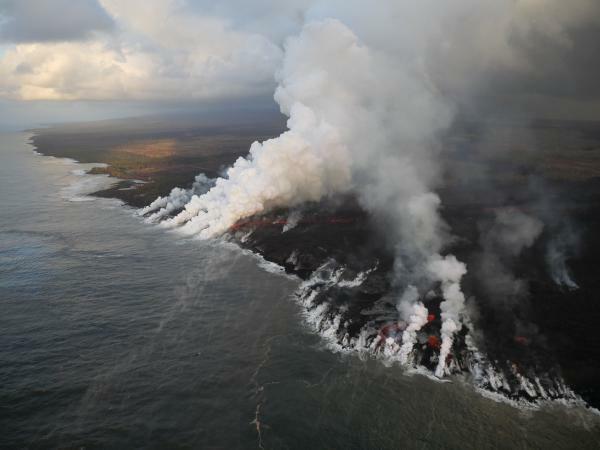 North of this, lava continues to “ooze out” at various points along the June-early July flow front, whose length now totals 6km (3.7 miles). While there’s no sign of activity at any fissures besides 8, the tiny island that popped up just offshore of Kapoho yesterday is still there for now.